Beacon designs complete custom-made padding systems for all sorts of field and facility applications. All of Beacon's padding is manufactured to your dimensions using a high-density, open-cell foam core with a heavy-duty 18-ounce vinyl laminated cover stock. The vinyl covering can be either UV treated for outdoor use or with fire retardant for indoor use. Pads can be secured to any surface using a variety of mounting options. All pads can be sized to make installation and removal easy so they can be stored safely during off-season periods. Gym wall padding can absorb a tremendous amount of impact, offering protection for your athletes. Full Circle wall padding is constructed using the highest quality plywood, foam and vinyl, and is available in either standard or as Class A Fire Rated wall pads. In addition, protective padding is available for I-beams, posts, stages and any other exposed area that may be a hazard. On-site evaluations and installations are available in the Northeast, and padding can be shipped nationwide. Even lighter and more rigid than Bison's popular Centerline® Aluminum System, the new value-priced Centerline Carbon Fiber volleyball system offers all of the same features as the original CarbonMax® except for the internal net height winder. Including the women's-height-only Lady CarbonMax™, Bison now offers three super lightweight carbon fiber volleyball systems to choose from. Every complete Bison volleyball system includes free padding lettering, net height gauge and socket adapters. Stop wasting time during practices and games chasing missed shots or errant passes and ensure the safety of athletes, coaches and spectators on adjacent fields. Jaypro has many systems to choose from: 20-by-65-foot Soccer System; 15-by-65-foot Multi-Sport System; and All Surface Friendly 12-foot Portable System. Custom options are also available. Covermate II™ is the professionally engineered, patented handling system from Covermaster. It is equipped with safety outriggers for greatly increased stability and dependability. Other safety features include end collars that prevent fingers from getting pinched between rollers and brackets and roller safety bolts that keep the rollers captive. Two foot-operated floor locks anchor the system solidly in place during handling. Introducing the Courtclean damp mop system. Tired of spending too much time cleaning your gym floor? Tired of losing games due to injuries caused by athletes slipping on dirty floors? Tired of spending thousands of dollars on refinishing floors every year? Eliminate these and many other nagging athletic flooring problems with one solution: Courtclean. Courtclean is so fast and effective that it can be used to clean your entire gym floor daily in less than five minutes. It produces the cleanest surface, causing traction to be at its highest level. 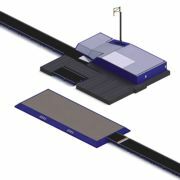 The Gill Raised Runway allows the flexibility to design runways that will accommodate the pole vault, long jump and triple jump for all levels of competition and practice. In the past, these types of runway systems have been priced upwards of $75,000. You can now have this facility solution at a fraction of that price. Play on the court that Olympic Gold Medalist, Karch Kiraly, helped create. This outdoor system from Spalding is everything you need to have the ultimate outdoor volleyball court. 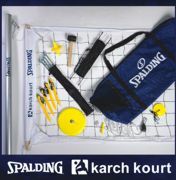 Contact your local Spalding rep to learn about the limited-time Outdoor Net System Special.